Has anyone who has a max used this charger?!? If so some thoughts please. I know this isn’t the correct place for this topic, but I figured I’d get a better response here. I got a price match at Best Buy who matched amazons price of $49.00. I want fast charging on a stand and currently have the Mophie first introduced with the 8plus and X. Thanks. Last edited by gadget22; 11-28-2018 at 08:53 PM. Which charger are you referring to? Sorry I thought it uploaded initially. This is it. 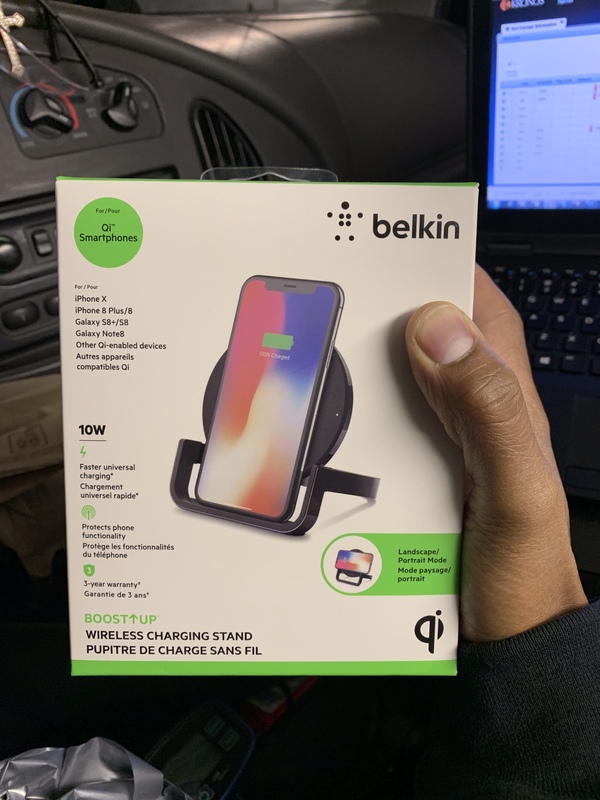 Nope haven’t used it, however, it is Belkin which means it’s certified by Apple for fast wireless charging. Belkin is certified by Apple for everything really. That’s why they sell so many Belkin products in Apple Stores. You shouldn’t have any issues with it. gadget22, aximtreo and Rob Phillips like this. Thanks.. I like that I can charge landscape or portrait. I’m gonna look for a good nightstand app now. Does the Max charge fine in this stand in both directions? Will the Max fit OK in this stand if you have a thicker case on the phone? It does charge in portrait and landscape. I have an apple leather case on mine, but it should be fine with thicker case on it. Nice, think I'll do the same. My daughter has this charger with her 8 Plus & she loves it. Can’t speak to the Max though. I’m assuming it’ll be just fine. Anyone find one for charging a iPhone XS Max + a Apple Watch? Trying to find one :P.
Nomad madks a nice one but the phone lays flat on it. I just picked up this charger today. Do the two little led's on yours faintly glow even when the phone is not on the charger? Thanks. Does your phone get hot while using this charger? This charger makes my phone way hotter than my Samsung or TYLT wireless chargers do. Hope I'm not damaging my phone using this charger. Well that’s not good. Heat is always a concern with inductive charging. The rumor with Apple still not releasing the AirPower charging mat that was announced with iPhone X/8/8+ is that they can’t seem to get heat problems under control. That said as long as it’s not getting so hot that it’s uncomfortable to pick up and hold you should be okay. I’ve always heard that wireless charging is worse for iPhone... is this true? I have a belkin portable that does both when not home. Why isn't my iPhone Opening even if it says its charging?